Spurgeon called this one of the supreme sayings of Scripture. That it rises like an Alpine summit, above all ordinary heights of speech. That it pierces the clouds and glistens in the light of God. That it is one of the most sublime utterances of the human mind. He also called it a rare flower of rich almighty grace. 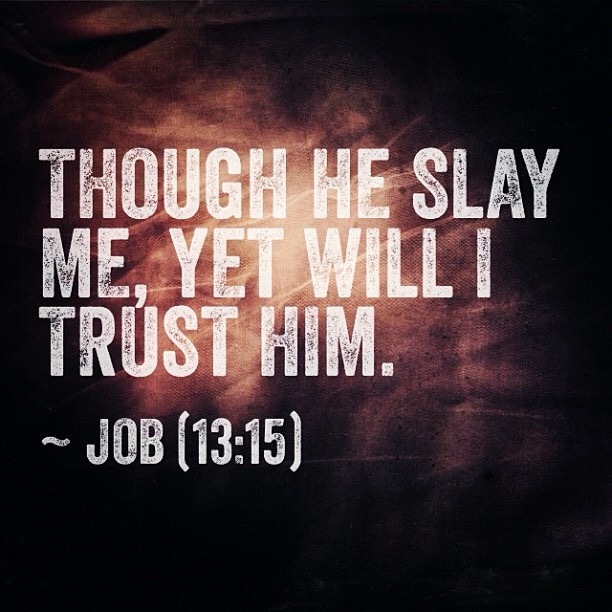 “Though He slay me, yet will I trust in Him.” – Job 13:15. This entry was posted in Christian and tagged Bible, Christian, Christianity, church, Faith, God, Gospel, Holy Spirit, Jesus, Love, Religion, Religion & Spirituality. Bookmark the permalink.